The first Checkers program I saw on eBay. Bought it a few years ago. Indianapolis joined the Central Hockey League for the 1979-80 season after several seasons in the World Hockey Association. The new team was called the Checkers and were the primary farm team of the New York Islanders. They played their home games at the 8,421-seat State Fair Coliseum. 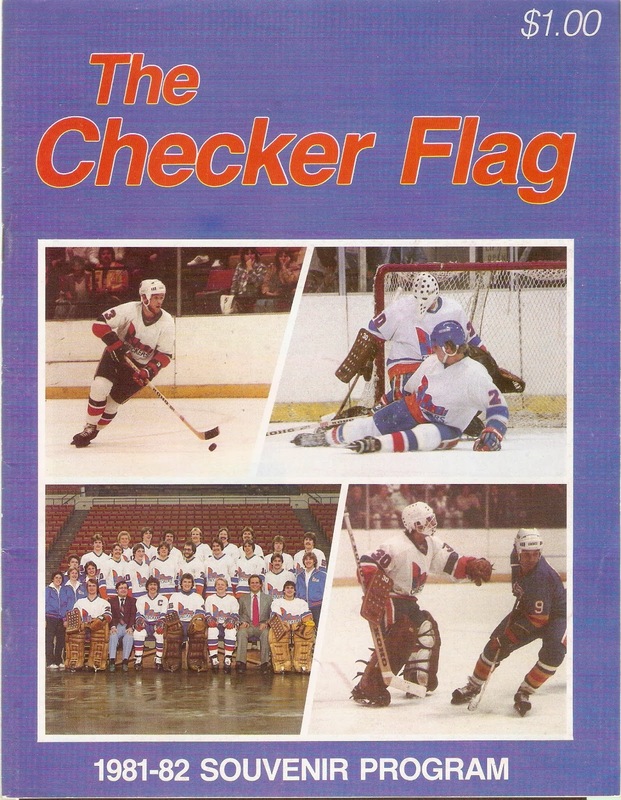 For the 1981-82 season, the Checkers were still affiliated with the Islanders, in the middle of their legendary dynasty. Indianapolis was coached by Fred Creighton, who was also General Manager. Creighton's squad had a solid season, going 42-33-5. That record was good enough for third place in the North Division, eight points behind league-leading Salt Lake. The Checkers scored the fourth-fewest goals that season, with 319 in the net. They were led by Don Laurence, who had 43 goals and 98 points. Two other players, Charlie Skojdt and Steve Stoyanovich, scored over 40 goals, and five others scored at least 20. Indy was much better on defense, as their 259 goals allowed was the lowest number in the CHL. Creighton used three different goaltenders that year. Future NHLer Kelly Hrudey played the bulk of the games for the Checkers. Hrudey, in 51 games, went 27-19-4 with a 2.95 GAA and 1 shutout. Rober Holland played in 30 games, going 15-11-1 with a 3.41 GAA on the year. Lorne Molleken was called up from Toledo of the IHL for four games. The Checkers drew the Tulsa Oilers in Round One of the Adams Cup Playoffs. Indy destroyed the Oilers in three straight, outscoring them 16-3, to advance to Round Two. They faced the Wichita Wind and swept them aside in four straight to advance to the Finals. The Checkers faced the Dallas Black Hawks for the Adams Cups. In a close series, the Checkers downed the Hawks in six to win their first-ever Adams Cup. Overall, 1981-82 was a pretty good season for the New York Islanders organization. The Isles' IHL team, the Toledo Goaldiggers, won the Turner Cup in five games over Saginaw. The Checkers won their first ever Adams Cup championship over Dallas. And, to top it off, the Islanders won their third-straight Stanley Cup, sweeping aside Vancouver in four. This program's 32 years old, but it's in excellent shape. It has 44 pages, mostly in black-and-white. Lots of pictures, ads and articles. There's also an article on the return of hockey to the Coliseum. Checkers netminder Kelly Hrudey would eventually make it to the Islanders and carve out a long career in the NHL, including stops in Los Angeles and San Jose. The Checkers also featured minor-league tough guy Frank Beaton. Beaton did score 13 goals and 41 points, but also piled up 270 penalty minutes, earning his nickname "Seldom". Aftermath: The Checkers would repeat as Adams Cup Champs in 1982-83 and lost in the Finals in 1983-84. When the Central League collapsed after that season, the Checkers joined the IHL with Salt Lake for the 1984-85 season.